With the ever-increasing number of ecommerce users, more and more ecommerce websites are coming up. There are several dedicated ecommerce platforms out there, such as Shopify, that take care of everything for you, such as web hosting and SSL certificates. Ecommerce stores can also be powered by WordPress. In this article, we’ll be learning how to sell physical goods on a WordPress site with the help of the WooCommerce plugin. It’s worth noting that WooCommerce ranks among some of the most popular ecommerce solutions out there. WooCommerce is a very popular and well-known WordPress plugin that lets you build an ecommerce store in WordPress itself. You can use it to add a shop to your existing WordPress blog or site, or you can build a standalone ecommerce site using WooCommerce. It’s totally free to use, but is backed by a wide range of free and premium extensions. Of course, depending on your requirements, you can choose to add or remove extensions as and when needed. However, for the most part, WooCommerce is a robust solution that functions pretty well even without any additional extensions. WooCommerce was launched and first maintained by the folks at WooThemes. However, when WooThemes was acquired by Automattic (the parent company behind WordPress), WooCommerce too changed hands and is under the Automattic umbrella currently. This also implies that security updates, bug fixes as well as compatibility with WordPress versions is not something the end users have to worry about at all. For selling physical goods, WooCommerce has become the de facto standard in the world of WordPress-powered ecommerce. You can gauge its popularity from the sheer fact that nowadays many WordPress theme sellers sell their themes using “WooCommerce friendly” as a marketing tag. In fact, many WordPress themes come with customized WooCommerce shop and checkout page templates that help you build a better-looking ecommerce store in no time! Once you have your WordPress installation all set up and ready, you can get started with the WooCommerce installation. Considering the fact that WooCommerce is a free WordPress plugin, it can be found in the official repository itself. Simply search for “woocommerce” in the Add Plugins page, and install it. The next step is to activate the WooCommerce plugin. As soon as it’s activated, you’ll notice that WooCommerce adds two new menu entries to the WordPress admin panel, with several sub-menus. But before going there, if this is your first time using WooCommerce, you’ll be redirected to a setup wizard. Should you wish to, you can skip the wizard. However, for first-time users, it’s a very good idea to use the wizard to set up the online store. You’ll be asked questions related to your business, such as its location, the currency in use, payment gateways, shipping terms and conditions, etc. WooCommerce comes with PayPal Standard support, but you can also choose to configure any other payment gateway of your choosing. Once again, it’s worth pointing out that, due to the popularity of WooCommerce, many payment solution providers now offer free or premium plugins for integrating their payment gateways into WooCommerce stores. The setup wizard will also ask you to set pages as Shop, My Account, Checkout pages. WooCommerce can create these pages automatically for you, though should you desire, you can select other pages for the same purpose. Note that much like the blog page template, these pages too should not have content of their own. 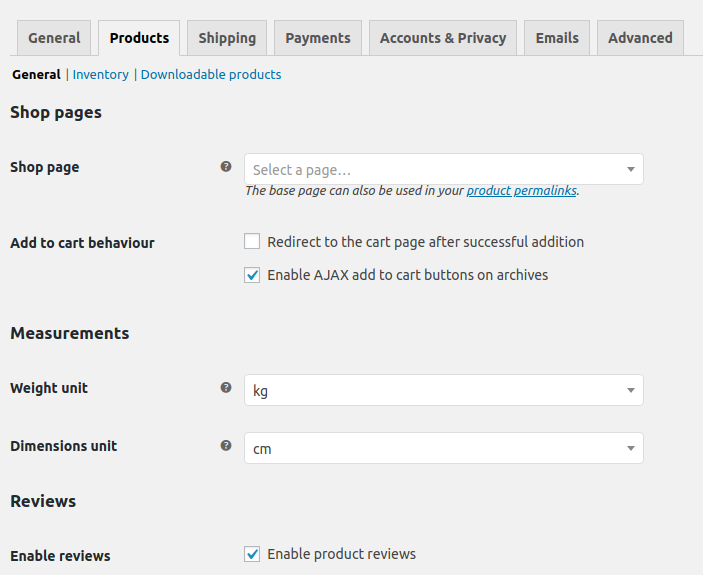 The first menu entry in the WordPress admin panel that WooCommerce adds is “WooCommerce”. This is where you can add coupons for discounts and promotions, specify and tweak payment gateways, and handle other settings related to your WooCommerce store. 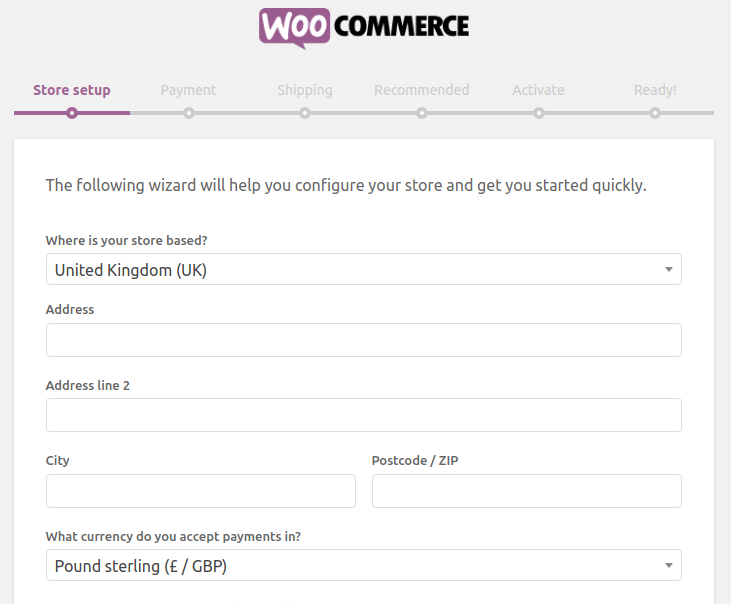 For example, you can customize geotargeting, activate or deactivate WooCommerce extensions’ features, etc. Naturally, it might appear daunting to a new user. With so many settings and menu entries, WooCommerce is by no means a minnow in the world of WordPress plugins. But considering the fact that running an ecommerce store in itself requires a greater deal of control, it’s imperative that WooCommerce let you customize several aspects of your store. The Settings page is rather self-explanatory. The General tab provides store-specific options, such as postal address, currency details, etc. The Products tab, on the other hand, lets you customize options such as measurement units, inventory and stock, etc. There’s also an option to handle downloadable products, such as ebooks and likewise. The Shipping page, as the name suggests, lets you set up shipping rules, conditions, refund policies, etc. The Emails tab handles email templates that are sent by WooCommerce to your buyers — on successful purchase, order confirmation, order cancellation, etc. You can choose to leave them as they are, or you can add your logo and other details to further personalize the emails’ appearance. Once you have tweaked and set everything up, it’s time to start adding your products to WooCommerce.